With no lines to memorize or dues to pay, beer occupies an enviable position in the movie industry. When directors want to make a point without troublesome dialogue or narration, they call for beer. Less than a star but more than a prop, beer is a time-honored player on the silver screen. Beer has a history as the drink of the common man, and when filmmakers want us to think of a character as “one of us,” that character often drinks beer. And if one of a film’s central themes is class conflict, you can be sure there’s a snooty wine-drinker on the horizon, and worlds are about to collide. Consider The Adventures of Robin Hood (1938), wherein the evil Prince John (Claude Rains) drinks wine from golden goblets in a Norman castle, and plots murder. Meanwhile, his good-hearted brother, King Richard the Lion Hearted (Ian Hunter), drinks English ale from a pewter mug in a Saxon inn. Another wine-drinking noble is The Student Prince (1954), whose elders feel he could use a little loosening up. Indeed, Prince Karl (Edmund Purdom) exhibits all the charm of a frosty suppository. So he is packed off to Heidelberg to mingle with his inferiors and lap up big frosties of another kind. This is a Hollywood Heidelberg, so the results are immediate. After draining one tall stein, he takes the lead in singing “Drink, Drink, Drink” (with the voice of Mario Lanza!) 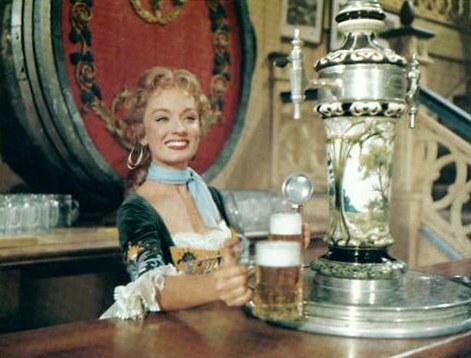 and falls in love with Kathie the barmaid (Ann Blyth, shown above) who teaches him to eat kraut and knockwurst. What a transformation. Sadly, it’s only temporary; the royal whelp abandons the barmaid for the good of his kingdom and returns to wine. But we are asked to believe that his fling with lager imbued him with at least a splash of humanity. In The Band Wagon (1953), Tony Hunter (Fred Astaire) is royalty of another kind, an actor whose star has fallen to the point where he finds himself in a dreadful musical version of Faust. After the first out-of-town performance, Hunter appears at a formal champagne celebration arranged for the show’s tuxedo and fur-clad backers; they, however, have already fled the specter of failure and caught the late train for Manhattan. Alone and bored, the star seeks out the chorus kids. He finds them in a hotel room, sitting on the floor and drinking beer out of fat brown quart bottles. Casting aside his pretension, Hunter joins the show’s writers (played by Nanette Fabray and Oscar Levant) in a tune called “More Beer” with lyrics like, “How I love a glass of beer more beer! Beer goes very good with beer, more beer!” The song is sung in counterpoint with “I Love Louisa” and succeeds in giving them all the spark they need to save the show without the help of the wealthy and powerful. In Bye Bye Birdie (1963), youth and age collide as Elvis-like pop star Conrad Birdie (Jesse Pearson) parks his motorcycle in an upper middle class living room and opens a well shaken can of beer. The resultant flying rope of foam pulls a whoop of horror from the home-owner, Harry McAfee, played exquisitely by Paul Lynde. In the Marx Brothers’ A Night At The Opera (1935), when the aristocratic singer Lasparri is knocked cold by his dresser, Tomasso (Harpo), two bystanders, Otis B. Driftwood (Groucho) and Fiorello (Chico), each put a foot on the fallen body as if it were a brass rail. Groucho looks straight ahead and says, “Two beers, bartender.” To which Chico adds, “I’ll have two beers too.” It is the triumph of the common man. The common man, however, is not always pictured as a noble conqueror. Alas, beer is often brought in to show that a character is rude, crude or stupid, as in “He eats beer and cheese balls for breakfast,” a line from Rob Reiner’s The Sure Thing (1985). In Heroes (1977), beer gets ugly when an addled but well-meaning Vietnam veteran (Henry Winkler) asks for a Dr. Brown’s Cel-Ray at a roadhouse and is fallen upon by beer swilling rednecks, one of whom smashes a beer bottle to use as a weapon. In the same film, Lynch uses brand preference to make a different point with far more subtlety. Jeffrey is on a date with Sandy (Laura Dern), a high school girl whose father is a police detective. “My dad drinks Bud,” she says. Jeffrey responds, “King of Beers,” solemnly highlighting the images of authority and conformity that are the foundations of the detective’s life. In spite of the fact that beer itself has no gender, to many filmmakers it is a male icon, and characters on the screen drink and speak of beer as a way of displaying their manhood. When not branding a guy as a guy, beer has also been used to make the point that some men are less manly than others. In High Plains Drifter (1973), the Stranger (Clint Eastwood) agrees to defend a Western town against outlaws, if given complete control. The townsfolk accept, and to seal the deal, the Stranger buys everyone a drink. The Stranger drinks whiskey; the men drink whiskey; a midget is handed a beer. Beer and whiskey clash again in the Howard Hawks classic, Rio Bravo (1959) where Sheriff Chance (John Wayne) offers a cold beer to a recovering alcoholic named Dude (Dean Martin) as a way of keeping him away from the hard stuff. The villains, of course, mock Dude for his failure to handle his whiskey. But beer has a bigger role to play in Rio Bravo, almost a speaking part. When Dude wings a killer and follows the trail of blood into a saloon, the bad guy is nowhere to be seen. Dude pauses at the bar. A glass of beer sits at his elbow. Suddenly, a drop of blood falls into the beer, ker-plunk. Dude pretends not to notice, then spins and fires up into the balcony where the gunman is hiding. The killer shuns the stairs and takes a slow last dive to the ground floor, betrayed by a telltale glass of beer. Another John Ford film, The Quiet Man (1952) is one of the best beer movies ever. When American Sean Thornton (John Wayne) returns to Ireland, the land of his birth, he stops at a pub. “I’ll try one of those black beers,” he says. “Ah, a porter,” replies Pat Cohan (Harry Tyler), the publican, and hand-pumped porter it is for the rest of the film. At a wedding of Thornton and Mary Kate Danaher (Maureen O’Hara), Micheleen Flynn (Barry Fitzgerald) is given champagne and spits it out as if poisoned; a moment later, someone hands him a pint to his enormous relief. In the midst of one of the great brawls of film history, Thornton and his brother-in-law Red Will Danaher (Victor McLaglen) stop at Cohan’s pub for refreshment. “Whiskey?” says Pat, “That’d be too warm; it gets your blood up. Porter’s the very thing.” Moments later, refreshed and chipper once more, the brawlers exit the pub through a closed door and the fight continues, until the two men reconcile and share a meal washed down by a pitcher of porter. In Smokey and the Bandit (1977), a truckload of Coors beer is the film’s engine, as Big Enos (Pat McCormick) and Little Enos (Paul Williams) challenge Smokey (Burt Reynolds) to cross state lines at high speed and deliver the brew on time. Beer (1985) has been described as “an unbeerable comedy,” but it has its moments. The brewer of Norbecker wants beer commercials like Anheuser-Busch makes, and his ad agency responds with the macho slogan, “Norbecker: If you’re tough enough.” Then they escalate to the more overt “Whip out your Norbecker,” with a whip crack as a sonic sweetener. It’s a refreshing send-up of thinly coded ads featuring rearing stallions. The film version of James M. Cain’s Double Indemnity (1944), scripted by Billy Wilder and Raymond Chandler, includes this exchange between a woman (Barbara Stanwyck) who wants her husband murdered and a smooth-talking insurance salesman (Fred MacMurray) she’s interviewing for the job. “Would you like some ice tea?” she asks. He replies, “Unless you’ve got a bottle of beer that’s not working.” Aside from great dialogue, the exchange’s subtle escalation, from iced tea to beer, foreshadows the relationship’s rise from professional to personal, from insurance policies to murder plans. Sometimes, a scene doesn’t call for a beer; the brewer does. Product placement — the practice of putting a brand in a movie in return for a supply of the product and/or a cash payment — is approximately 20 years old as an industry. The filmmaker gets to defray the costs of production, and the brewer builds awareness and image. One placement firm, UPP Entertainment Marketing in Burbank, California, reviews up to 20 scripts a week, identifying appropriate movie projects for clients like Proctor & Gamble, McDonald’s and Coors Brewing. Gary Mezzatesta, the president of UPP Entertainment Marketing, notes that protecting his clients from film appearances they should avoid is just as important a task as placement. No brewer wants their product shown in scenes involving mayhem and sudden death. Regardless of a placement firm’s efforts, directors have the final say on what appears in their films. And in a nice twist on the practice, Repo Man (1984) featured generic, white label “BEER” throughout the film. Anyone who’s ever spent time in a dry county or a dry campus, Basic Training or the Big House, knows that one of the simplest measures of freedom is the ability to obtain and drink beer. And one of the simplest ways to rebel is to crack a cold one. What would life be, after all, without Animal House (1978)? Beer is the film’s life’s blood, an indispensable accompaniment to the wildness. The images are indelible: Bluto (John Belushi) crushing cans and shattering bottles on his head. The pledges’ beer shower. The red and blue cans lined up on the dashboard during the road trip. Beer bottles whizzing through the air and shattering on the fraternity’s front door as each new guest arrives. Boon (Peter Riegert) ordering “a rock & rye and seven Carlings for my friends.” The film is one act of rebellion after another, and beer proudly does its part. For malty movie memories, I thank Cliff Baker, Kathy Biehl, Frank M. Bland, Sean Branagan, Tim Cree, Brett Davis, Casey Dickinson, Cinde Dolphin, Armand Dupont, Andy Ferullo, Dr. Tom Flemming, Linda Fowler, Al Hoff, Terry Johnson, Stan Kellum, Bill Keonig, Bill Krauss, Tim League, Toby Levy, Michael Marks, Micki Maynard, Gary Mezzatesta, Peter J. Neff, Brian Philippi, Amelia Rosner, Marc Rubenstein of Middle Ages Brewing, Jack Turlington, William Vinal, Sean Winship, Susan Yolen, and the Internet Movie Database. This article first appeared in All About Beer magazine in 1998.